Hillary Clinton celebrates her victory Saturday night in Columbia, S.C.
As she celebrated a jaw-dropping victory Saturday night in South Carolina, Democratic presidential candidate Hillary Clinton turned her gaze to the general election. “Tomorrow, this campaign goes national,” she told a roaring crowd of supporters in Columbia at the University of South Carolina's Carolina Volleyball Center. With nearly every precinct reporting, Clinton was leading Sen. Bernie Sanders (I-Vt.) late Saturday 74 percent to 26 percent. The 48-point margin was more than twice what many observers had predicted. Clinton was on track to take 39 delegates to Sanders’ 14. Even more jarring to the Sanders campaign than the size of his loss was his drubbing among African Americans, who made up 62 percent of the electorate. According to exit polls, black voters split 87 percent to 13 percent in Clinton’s favor. Clinton’s strong showing came just three days before the biggest prize yet of the primary season: Super Tuesday, when 11 states weigh in on the Democratic presidential nomination. Sanders is hoping to score victories in a handful of those states — Massachusetts, Minnesota, Colorado, Oklahoma and his home state of Vermont — but Clinton’s renewed momentum could make that difficult. 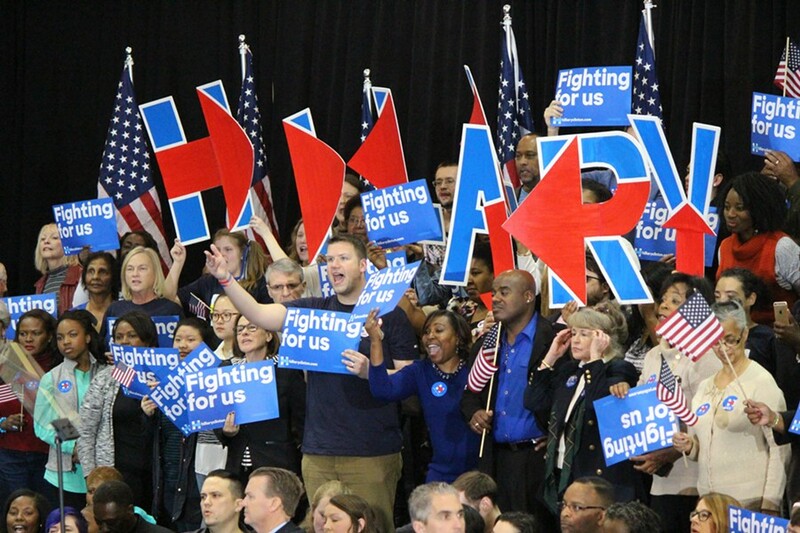 Clinton supporters Saturday night in Columbia, S.C.
As she has since suffering setbacks early this month in Iowa and New Hampshire, Clinton continued to co-opt Sanders’ populist message Saturday night. Even as she dispatched Sanders in South Carolina, Clinton appeared eager to confront the leading candidate for the Republican nomination: real estate tycoon and reality television star Donald Trump. Striking an optimistic tone, Clinton seemed keen to contrast her message with the increasingly hostile — and, at times, juvenile — rhetoric of the Republican nominating contest. Clinton’s supporters at the Carolina Volleyball Center didn’t have to wait long to learn the outcome of Saturday’s primary. They counted down to 7 p.m., waiting for polls to close around the state, and erupted in cheers when CNN declared Clinton the victor. “Hillary! 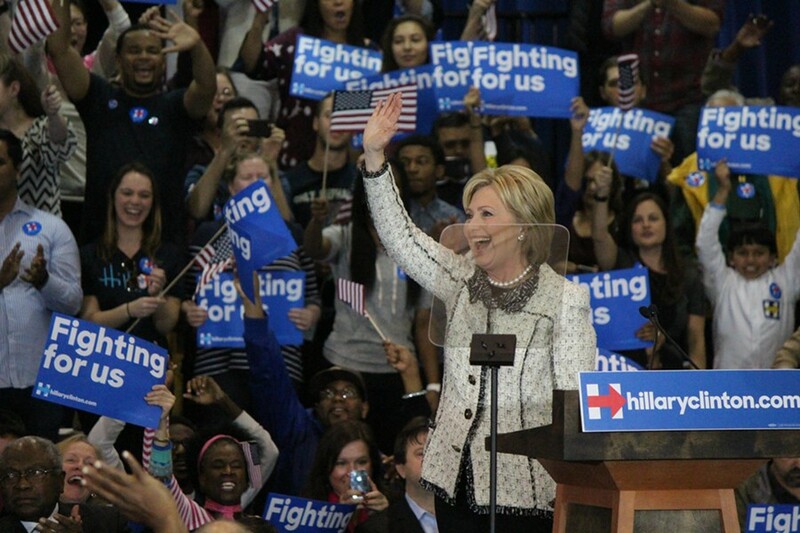 Hillary!” they chanted, waving American flags and blue and white campaign signs. 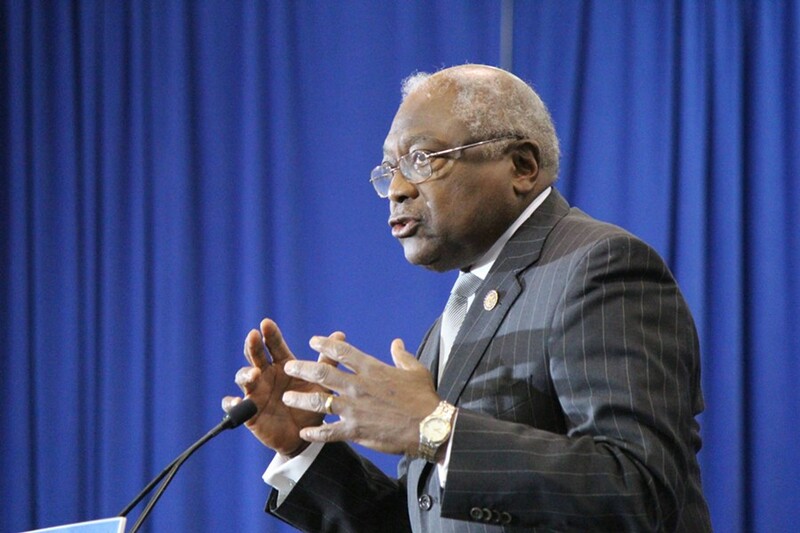 Congressman James Clyburn introduces Hillary Clinton Saturday night in Columbia, S.C.
Forty minutes later, Clinton’s most prominent supporter in the state, Congressman James Clyburn (D-S.C.), delivered an impassioned introduction to the candidate he’d endorsed a week earlier. Though South Carolina votes reliably Republican, Calef expressed confidence that Clinton could compete in the general election — particularly if she faced off against Trump. “A lot of Republicans that I know — friends of mine — they would rather now turn over to the Democratic Party and vote for Hillary than to vote for Trump,” she said. 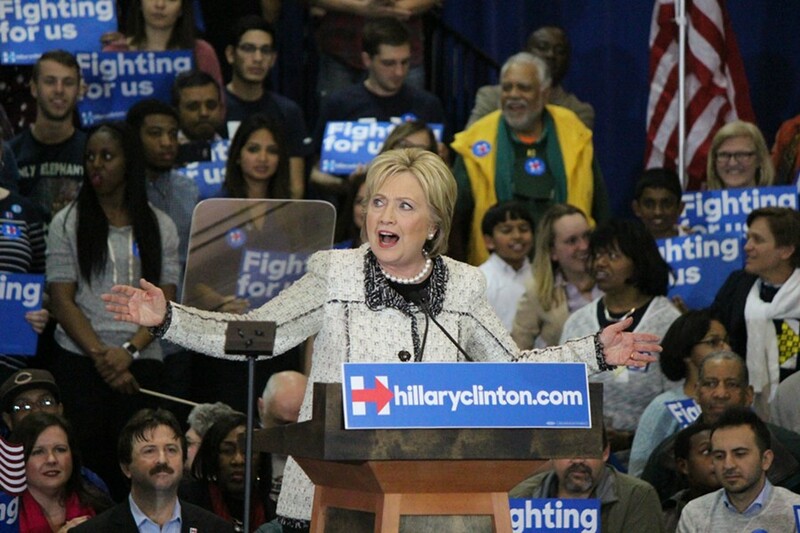 Clinton’s Democratic rival didn’t stick around to learn the result. Sanders left South Carolina Saturday morning for a series of rallies in Texas and Minnesota. According to reporters traveling with him, his plane took off from Dallas just moments before the polls closed in South Carolina. After landing in Rochester, Minn., and learning the extent of his loss, Sanders delivered brief remarks to those reporters before heading to a rally.